Earlier this month, we pointed to a mysterious clock countdown held by AUX at a URL called thiscouldbeanywhereintheworld.com. Well, our guesses were correct: Alexisonfire are directly involved, as they plan to perform their Dog's Blood EP for a special in-store at Toronto's Sonic Boom Records. The show is taking place on Friday (December 17) at 3 p.m. Because it's a first come, first serve event, the chances are slim that everyone who wants to get in will. If you're out of luck, or if you don't live in Toronto, the show will be streamed live on the Alexisonfire Facebook page. 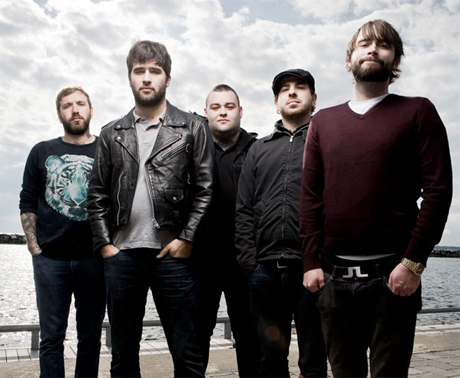 Alexisonfire also have a handful of full-sized concert appearances throughout Ontario over the next few days, kicking off with a show in London, ON tonight (December 15). All dates are available below.